Professor elemental was born in deepest Ipswich, the latest in a long line of loons. His father was a victim of a severe grinding accident whilst working on the creation of a new grinding machine, leaving baby elemental to be raised under the watchful eye of his overprotective mother. Fed on a diet of pureed swan and old-fashioned British madness, he soon grew into one of the least respected and most ridiculed Professors to ever be turned away from every London society (including the cub scouts and the WI). Undeterred, he continues to work tirelessly on inventions that are both unwanted and unwelcome in polite society with the aid of his trusty butler Pugh and his Augmented Oran tang Geoffrey. He enjoys dissection, gin and shrieking with maniacal giggles at inopportune moments. Aside from a few of his experiments (best left unmentioned), the Professor first got himself noticed with the track Cup of Brown Joy. The video, which has notched up over 2 million views on YouTube. 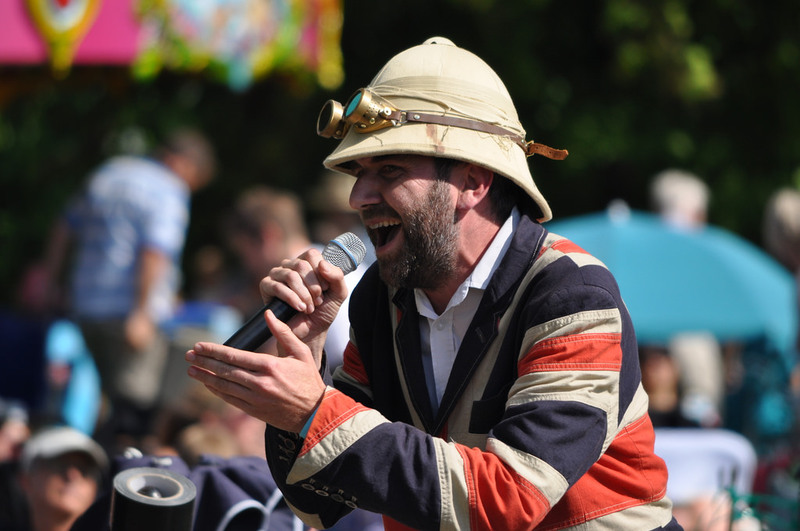 Known for his outlandish live shows and delightful knees, recent appearances have included The Bizarre Ball, Secret Garden Festival, The Canadian Steampunk Expo and the Steampunk World’s Fair.